Forty-nine scientists, led by Enrico Fermi, were present in a converted squash court at the University of Chicago's abandoned Stagg Field on Dec. 2, 1942, when Chicago Pile 1, the world's first nuclear reactor went critical. 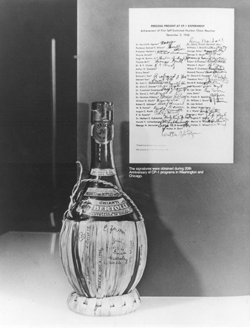 To celebrate their success, Eugene Wigner opened a bottle of Chianti he had purchased months before in anticipation of the event. The group silently sipped Chianti from paper cups, then passed the bottle around and signed the straw wrapping. Twenty years later, at a reunion of the CP-1 pioneers, a list of the names of all those who signed the Chianti bottle was printed up, and all the pioneers present at that reunion added their signatures by their names (the signed list is shown below). Over the years, a myth has persisted that “all the people at the first reactor died of cancer”. To refute this myth, Argonne National Laboratory began tracking these pioneers and, for those who passed away, noting the cause of death. The information collected to date (listed below) clearly proves the myth to be false; for the sake of collecting as complete a set of data as possible, this tracking project is still active*. A Chianti bottle, shared and signed by all 49 participants at the critical moment. 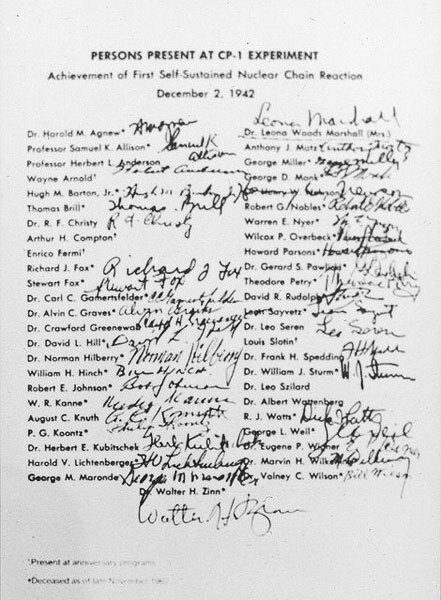 Behind, a list of signatures from the 20th reunion of the CP-1 pioneers. Click on image to view larger image. Year of death is known for 42 pioneers. 34 of these died 36 or more years after the CP-1 initial criticality, with 25 dying 50 or more years after CP-1 went critical. Age at death is known for 37 pioneers; of these, 28 were 70 or older when they died, with 13 being 90 or older. Among the remaining 9, 2 were in their 50’s at the time of death, 6 were in their 60’s, and 1 died in his 30’s due to an accident. Cause of death is known for 29 pioneers. 11 died of heart disease, 5 of strokes, 2 of lung diseases, 7 of cancers unlikely to have been caused by radiation exposure, 1 of Alzheimer’s complications, 1 of hepatitis, 1 due to injuries suffered in a fall at his home, and 1 due to a work-related accident. 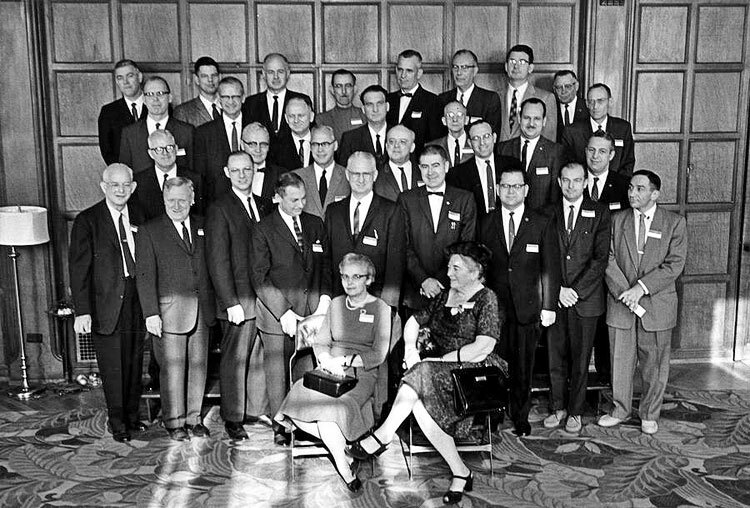 Note that any CP-1 pioneers still living are now past 90 years old. 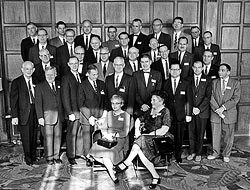 DISCLAIMER - Please understand that Argonne National Laboratory and the Nuclear Engineering Division are not responsible for the contents of any of the external websites linked to or referenced in the CP-1 Pioneers list, other than any which originate within Argonne. No endorsement of any organization or site is intended by this linking/referencing, and none should be inferred. 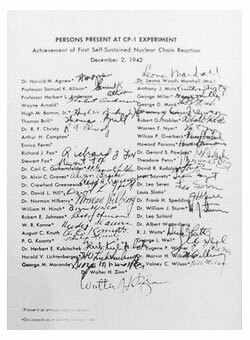 The list of signatures from the 20th reunion of the CP-1 pioneers. Click on image to view larger image. Harold M. Agnew — Retired director of the Los Alamos National Laboratory, died September 29, 2013 at age 92 of chronic lymphocytic leukemia. Described his experiences working on CP-1 at the Argonne Director's Special Symposium, "The Dawn of the Nuclear Age" June 28, 2012. Samuel K. Allison — Died September 15, 1965 at age 64 while attending the Plasma Physics and Controlled Nuclear Fusion Research Conference in Culham, England of complications following an aortic aneurism. Herbert L. Anderson — Died July 16, 1988 at age 74, of berylliosis. Hugh M. Barton — Died Nov. 30, 2004, from congestive heart failure. Thomas Brill — Died Sept. 15, 1998, in Aurora, Colo., age 78, of multiple myelomas. Robert F. Christy — Died October 5, 2012 at age 96 from natural causes. Originally a student of J. Robert Oppenheimer, who recruited him for the Manhattan Project, he began teaching at the California Institute of Technology in 1946, where he remained until retirement, serving as provost from 1970 to 1980 and as acting president from 1977 to 1978. Arthur H. Compton — Died of heart attack March 15, 1962 at age 69. Richard J. Fox — Died April 9, 1996, of a stroke. Stewart Fox — Living in the Bahamas. Carl C. Gamertsfelder — Died of a heart attack in 1996 at age 82. Alvin C. Graves — Died July 29, 1965 at age 56, of a heart attack. Graves was present at the same radiation accident in 1946 that killed Louis Slotin and received a dose that was not fatal but that did cause a permanent vision impairment. Crawford H. Greenewalt — Died September 27, 1993 at age 91, of a stroke. Norman Hilberry — Died March 28, 1986 at age 87, of complications from influenza. He was associate director of Argonne under Walter Zinn, beginning with Argonne’s establishment in 1946, and served as Argonne’s director from 1957-1961. David L. Hill — Died December 14, 2008 at age 89 in Rochester, New York of natural causes. William H. Hinch — Died March 26, 2005, in Englewood, Colo., age 85, of complications resulting from pancreatic cancer. Robert E. Johnson — Died Dec. 10, 2009, at age 91 in Palos Park, Ill.
W.R. Kanne — Died Oct. 24, 1985, of intestinal cancer. August C. Knuth —Died May 1982 at age 83 of unspecified causes. Phillip Grant Koontz — Died from a heart attack in 1991 at age 87 in Boulder, Colo.
Herbert E. Kubitschek — Died from multiple forms of cancer, Nov. 30, 1989, at age 69, in Hinsdale, Ill.
Harold V. Lichtenberger — Died Dec. 7, 1993 at age 73, of stomach cancer. He and Albert Wattenberg, another CP-1 pioneer, directed the design, assembly, and testing of the first enriched uranium heavy water reactor. Together with Walter Zinn, he directed a number of experiments at Argonne-West, including the EBR-I experiments and the BORAX-III experiment that first powered the town of Arco, Idaho. George M. Maronde — Died April 18, 1966, of a heart attack. Anthony J. Matz — No information. George Miller — Living in California. George D. Monk — No information. Henry P. Newson — Died in 1978. Robert G. Nobles — Died June 12, 2007 at age 90 of natural causes. Warren E. Nyer — Died February 4, 2016 at age 94 of natural causes. Spoke to the World Nuclear University Summer Institute in Idaho Falls, Idaho, on July 22, 2005, about his experience at CP-1. See also Multimedia below. Wilcox P. Overbeck — Died May 5, 1980, age 68, of arteriosclerosis after defeating cancer 10 years earlier. He was a director of the Savannah River Laboratory. J. Howard Parsons — Died September 21, 2012. He made a short presentation about CP-1, June 2, 2000, at Tuffree Middle School, Placentia, California. Gerard S. Pawlicki — Died May 15, 2013 at age 91, due to complications from injuries suffered in a fall at his home. He was also an instructor at Argonne’s International School, where he performed pioneering work in reactor core analysis, using early analog and digital computers, and taught FORTRAN programming to a generation of researchers. Theodore Petry — Died July 28, 2018 at age 94 of esophageal cancer. David P. Rudolph — Died December 23, 2006 at age 87, after a long illness. Leon Sayvetz —Died April 24, 2014 at the age of 91 at his home in Puget Sound, Washington. Mr. Sayvetz loved to sail and was also a classical violinist. Leo Seren — Died Jan. 3, 2002 at age 83, of amyloidosis with heart involvement, in Evanston, Illinois. Louis Slotin — Died in radiation accident at Los Alamos, May 30, 1946 at age 35. Frank H. Spedding — Died December 15, 1984 at age 82, of a heart attack. William J. Sturm — Died July 25, 1999 at age 81, of Hepatitis C. He joined Argonne in 1956 and served as assistant director of applied physics for 32 years. Leo Szilard — Developed bladder cancer, but died May 30, 1964, at age 66 of heart attack. .
Albert Wattenberg — Died June 27, 2007 at age 90. Employed at Argonne from 1947 to 1950, he and Harold Lichtenberger, another CP-1 pioneer, directed the design, assembly, and testing of the first enriched uranium heavy water reactor. He was director of Argonne’s Nuclear Physics Division from 1949 to 1950. Richard J. Watts — Living in New Mexico. George L. Weil — Died July 1, 1995, at age 87 in Washington, D.C., from stroke and heart problems. 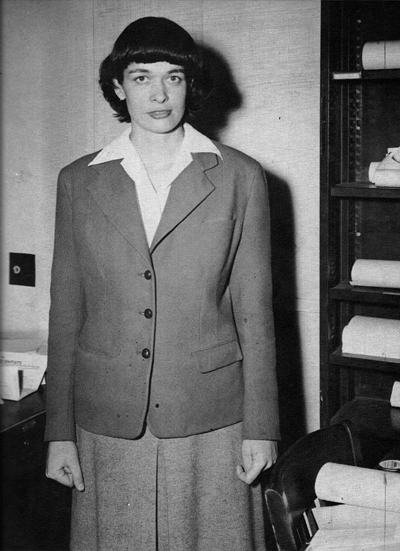 CP-1 Pioneer Dr. Leona Woods. Read more on Dr. Woods at ANS Nuclear Cafe. Click to enlarge photo. Eugene P. Wigner — Died Jan. 1, 1995, at age 92, of complications from Alzheimer's disease. Marvin H. Wilkening — Died Sept. 24, 2006, at age 88 in Las Cruces, N.M.
Volney C. (Bill) Wilson — Retired from General Electric Research Laboratory. Died of natural causes April 1, 2006, at age 96 in Wisconsin. Leona Woods (Marshall Libby) — Died November 10, 1986 at age 67, of anesthesia-induced stroke. Walter H. Zinn — Argonne National Laboratory’s first director died at age 93 on Feb. 14, 2000, of a stroke.